The small resort towns of Saugatuck and Douglas are close enough together to be considered one holiday destination. Popular for weekend getaways from Detroit and Chicago, the towns are located along the shore of Lake Michigan, in the southwest of the state. The area is known for its eclectic and artistic feel, with dozens of art galleries, and plenty of good restaurants and bars. 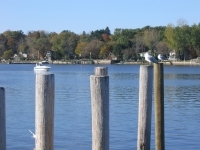 Saugatuck-Douglas offers a number of activities for visitors, including fishing, hiking, sailing, golf, bowling, horseback riding, kayaking, dune buggy outings and lake cruises. There are also some small sandy beaches that offer scenic spots for swimming and sunbathing.